Join Max's quest to become a knight in this laugh-filled, New York Times bestselling adventure from the author of the Big Nate series! Max wants to be a knight! Too bad that dream is about as likely as finding a friendly dragon. But when Max's uncle Budrick is kidnapped by the cruel King Gastley, Max has to act...and fast! Joined by a band of brave adventurers--the Midknights--Max sets out on a thrilling quest: to save Uncle Budrick and restore the realm of Byjovia to its former high spirits! Magic and (mis)adventures abound in this hilarious illustrated novel from the New York Times bestselling creator of the Big Nate series, Lincoln Peirce. 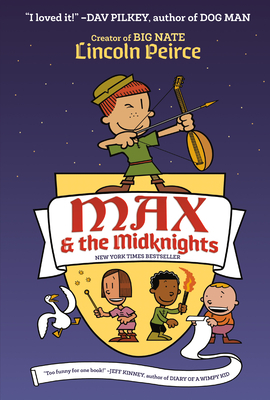 Max and the Midknights, Lincoln's first book for Crown Books for Young Readers, originated as an unfinished spoof of sword & sorcery tales. Returning to the idea years later, Lincoln rewrote the story around Max, a ten-year-old apprentice troubadour who dreams of becoming a knight. The result is a high-spirited medieval adventure, supported by hundreds of dynamic illustrations employing the language of comics. Of the lively visual format that has become his trademark, Lincoln says, "I try to write the sort of books I would have loved reading when I was a kid." When he is not writing or drawing, Lincoln enjoys playing ice hockey, doing crossword puzzles, and hosting a weekly radio show devoted to vintage country music. He and his wife, Jessica, have two children and live in Portland, Maine.